Eva Kiss, our Hungarian professor of Communist history, yanked down the screen in front of the classroom and projected old film footage of the violent, anti-Communist revolution in Timișoara, a large city in western Romania. It was an apt conclusion to her lecture series on the 1989 Revolution in Romania, and Professor Kiss stood off to the side and let the images on screen tell the truth of the suppressed uprising. 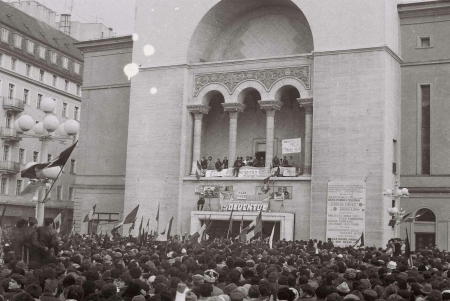 As we learned in her class and now saw on film, masses of Romanians assembled around the National Opera House to protest against their oppressive communist dictator , Nicolae Ceauşescu. This was the most violent, by far, of the uprisings in Eastern Europe in 1989, and even with the grainy footage, the violence was evident. It documented a bloody struggle: obedient soldiers shooting civilians, Soviet tanks physically crushing demonstrators, and brave revolutionaries waving ripped Socialist Romanian flags in defiance. This was a defining moment for my fellow students and I in Calvin College’s semester in Hungary program, during the Fall of 2013. Two weeks later we took an excursion to Timișoara, the film footage still fresh in our minds. Fighting nausea as our fearless bus driver conquered the mountainside roads of Romania, we gladly stumbled out in the rain to explore where the revolution occurred. Timișoara was not like any place we had been before. 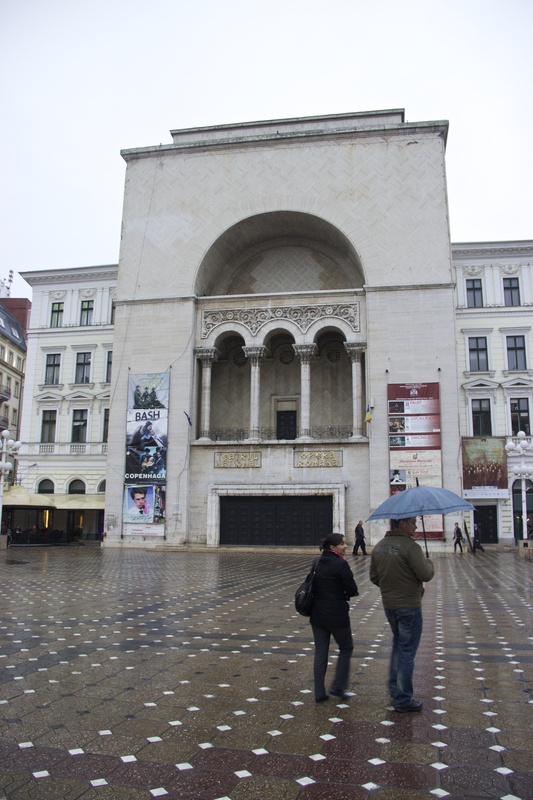 The city was dark under stormy weather, but the palpable gloom seemed a physical reminder of the horrors that had plagued Romania under Ceauşescu in the not so distant past. Buildings appeared as if built for function alone; groups of people blended anonymously with the streets, bundled in dark colors. It felt as though we had traded spirited Budapest for repressive Communist functionality in a mere 9-hour bus ride. As we neared the city center, some bright and familiar Golden Arches appeared in distinct juxtaposition to the dreary Communist-era buildings. Yet, the flash of recognition and our surprised chuckles quickly dissolved. Opposite the familiar sight of McDonalds stood the famous Romanian National Opera House. We looked down at our feet and realized that we were standing exactly where Romanians had gathered in 1989 to hear the last harsh words of Ceauşescu himself. In the rain, it wasn’t hard to imagine. I experienced a number of moments like these while in Hungary and other parts of Eastern Europe: where encounters with places or people left us humbled and filled with the presence of the past. Periodically throughout the semester, our Calvin professor planned encounters with historical places. We visited Auschwitz-Birkenau in Poland, the most infamous of the death camps the Nazis built to exterminate Jews. 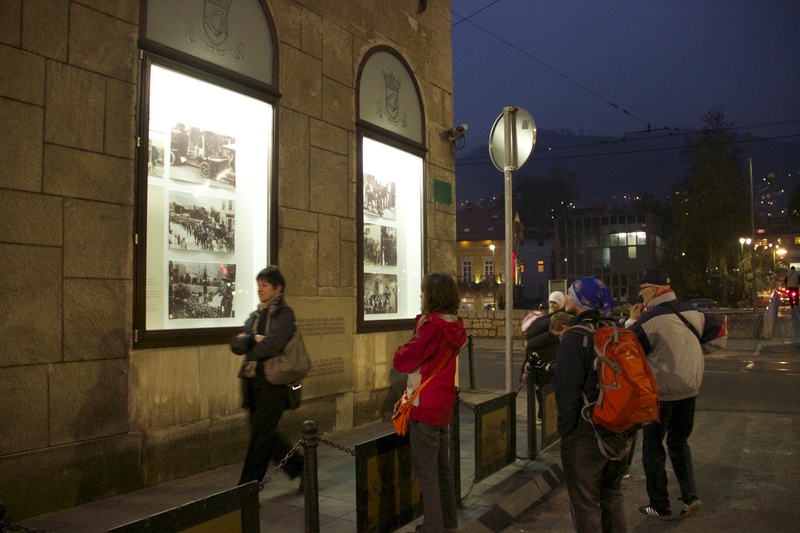 We paused on the street corner in Sarajevo where Gavrilo Princip shot Archduke Franz Ferdinand of Austria, sparking World War I. 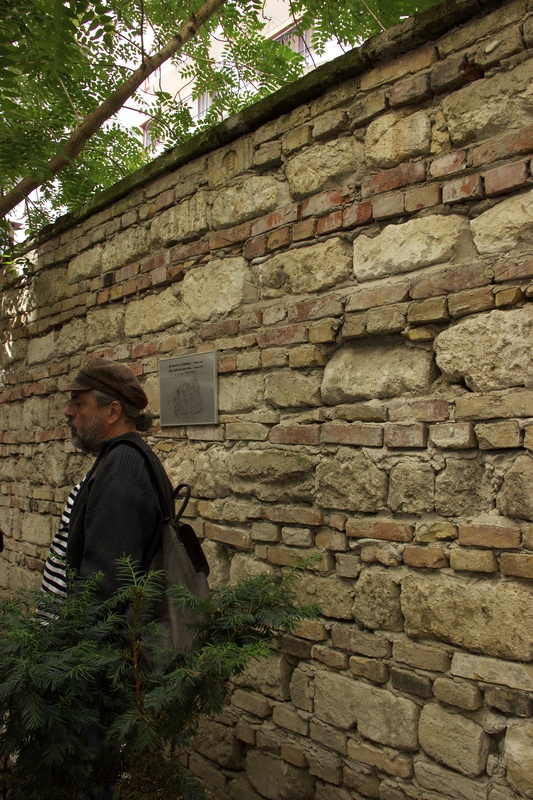 We even toured the remains of the pre-World War II Jewish Ghetto in Budapest, which is now nothing more than a short wall, fighting against modern urban development. Other brushes with the past were less intentional. Once while reading Castles Burning, an autobiography of a Jewish girl from Budapest in WWII, I recognized a street in Budapest that had become familiar to me through desperate walks to find a good cup of kávé. After that, even the streets of our temporary home felt more significant. Sometimes we were pleasantly surprised to stumble onto historical sites: the Habsburg palace still stood in her beautiful glory on Buda’s Castle Hill. We raced like kids around the ruins of the Roman Military Amphitheatre in the backyard of a lower-class neighborhood. 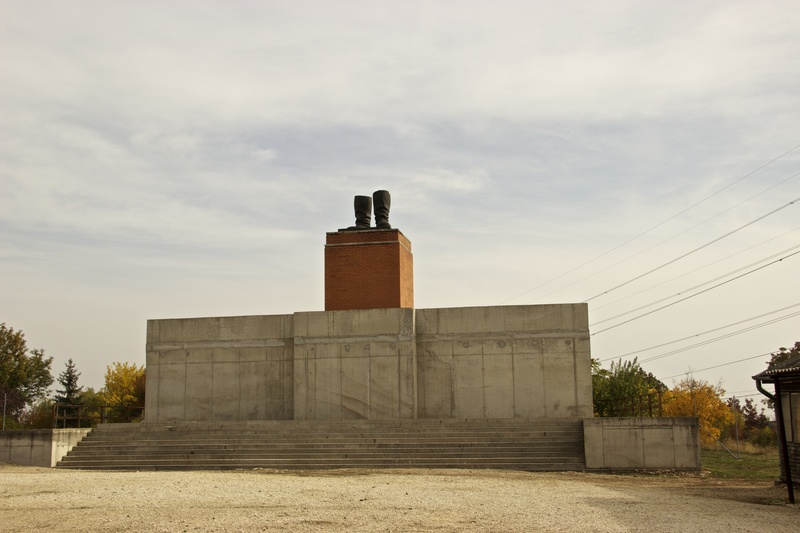 We chuckled when we saw the only remains of a Stalin statue (the feet) in Memento Park. In time, I slowly discovered that encounters with historical places enriched my understanding and historical study. I also learned firsthand how history in Eastern Europe is personal over late night conversations with Hungarian friends. Class lectures by Professor Kiss concerning the 1956 revolution in Hungary came alive as my roommate, Dorisz, and I whispered quietly of her nagypapa taken in the night for questioning. Although her family has stopped talking about it, the memory is still very much present. So too is personal memory kept hushed in much of post-Communist Eastern Europe. After we left our position in front of the National Opera House that day in Timișoara, we made our way to the small 1989 Revolution Museum, a building that housed chilling evidence from the revolution and which desperately needed government funding. We met the proud curator of the museum, a man who still limped from a wound won in the revolution. He explained to us that as long as the Romanian government is unwilling to fully deal with its tumultuous past, so too will Romanians today be unable to confront societal problems that originated under Ceauşescu. When I set out in September, I hoped that my previous studies of Communist and Cold War history would enhance my experiences and education in Hungary. Instead, I found that the opposite was more often true. Prior study had given me a sense of context for historical encounters; but in experiencing new places and befriending locals I was provided with more than material evidence. I knew I had encountered the past. In admiration for this kind of experiential history, I found a renewed desire to further study Eastern European history. The domain of Eastern European history has captured my attention and I hope to continue scholarly pursuits in this arena; I am drawn to study it, and I long to know it well. I hope as I further dive into Eastern European adventures, whether in history books, in person, or in my future career, a collision of knowledge and experience will become the norm and that the distance between the two will be erased. Hailey De Jong is a senior history major at Calvin College. This entry was posted in Student Voices and tagged Budapest, Eastern Europe, history, Hungary, memory, Romania, study abroad, Timișoara. Bookmark the permalink.